Spite and Malice is a game that plays a lot like a two-player solitaire variant. Like many older card games, it has been reimagined as a commercially-available game with a custom deck; Spite and Malice was adapted to become Skip-Bo. The object of Spite and Malice is to be the first player to deplete their talon pile. Spite and Malice needs two standard 52-card decks of playing cards, which are shuffled together to form a 104-card pack. 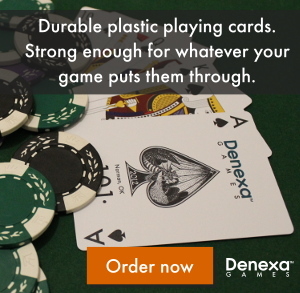 If you have a set of Denexa 100% Plastic Playing Cards handy, you’ve got everything covered on the card front, since it includes two decks. Shuffle and deal 20 cards from the combined deck face down to each player. This forms the player’s talon pile and is placed at each player’s right. The top card of the talon is turned face-up and put on the top of the stack, but the remaining cards cannot be looked at. Each player is also dealt a hand of five cards, which they may look at (but their opponent may not). The deck stub becomes the stock and is placed to the side in the middle of the table. 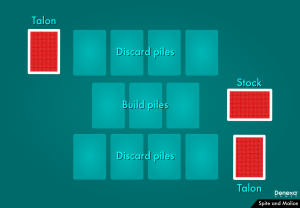 The center of the table is partitioned out as follows: in the center of the table will be the three build piles, then, on the next row closest to each player, they have their own four discard piles. Initially, none of these piles will contain any cards, so the center of the table will be empty until play begins. Unlike in some similar games like Speed, each player takes turns. The primary goal of each player will be to move cards, hopefully mostly from their talons, to the build piles in the center of the table. Kings are wild in Spite and Malice, with aces ranking low and the remainder of the cards following in the conventional order, with queen as the highest. Suits are immaterial to the game. If a player begins their turn with fewer than five cards, the first thing they do is draw back up to five from the stock. On a player’s turn, they may play as many cards as they wish face-up to the build piles; these cards may be the top card of their talon (at which point a new top card is exposed) or one of the five cards from their hand. Each build pile begins with an ace, and is then built up in sequence to the queen. When a pile reaches the queen, it is removed and shuffled into the stock. There may only be three build piles at any time; new piles can only be formed by an ace when there is an empty pile to begin adding cards to. If a player depletes their hand on a single turn, they may draw five new cards and continue onward. A player may also take one card from their hand (not the talon) and put it face-up in one of their discard piles. A player may only have four discard piles; if they wish to add more cards, they must put the new card on top of one of the existing discards, making it inaccessible until the card on top of it is moved. When a card in the discard pile is played, the player’s turn ends and they cannot make any further actions until it is their turn again. 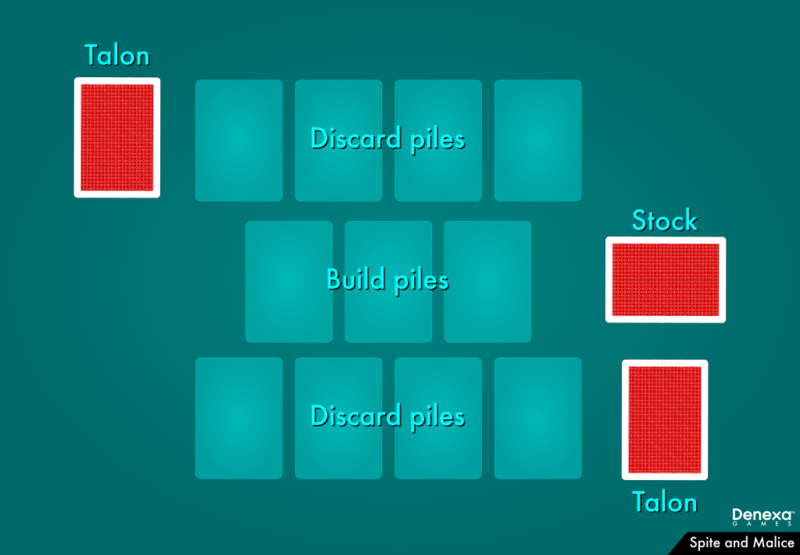 Cards in the discard piles may be played only to the build piles on subsequent turns; they may not be moved to the player’s hand or from one discard pile to another. Game play continues until one player depletes their talon, winning the game. If the stock runs out of cards (presumably because a stalemate has been reached, preventing any of the build piles to be completed to replenish it), whoever has the fewest cards in their talon is the winner. Sign up for our email service! You'll get a 493-page ebook of card game rules just for signing up. This blog is a product of Denexa Games. Here, you'll find the rules to many card games, both popular and obscure, as well as advice for hosting your own home game night, plus etiquette tips to keep your games running smoothly. We also share news about the company that you'll hopefully find interesting. Denexa Games was founded in 2012 and is based in Norman, Oklahoma. We provide the highest-quality 100% plastic playing cards on the market. You can find out more about us on our About page. Host the perfect card game night with our 493-page e-book. 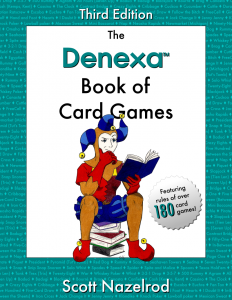 Sign up for our email service and get The Denexa Book of Card Games, a 493-page e-book with the rules to over 180 card games, including the old classics, plus children’s games, solitaire games, and games you’ve probably never heard of before. Absolutely free. More details about what we’ll send.